A short sale is simply negotiating a mortgage payoff with lienholders for less than what is owed and is typically executed to prevent foreclosure. But, whether a short sale will work or not depends on the bank or lender holding the mortgage. If it is to the bank’s advantage (e.g., will result in smaller financial loss than foreclosing), then they will most likely consider this option favorably. In a short sale, the lender can agree to discount the loan balance due to financial hardship on the part of the homeowner. It is possible (although not always) that the lender will accept the proceeds of the sale of the property and consider the loan paid in full, even though the sale price might be less than what was originally owed. In this instance, the lender has the right to approve or disapprove of a proposed sale. Sometimes, the lender is not willing to accept an amount less than what is owed. All of this should be negotiated beforehand, which is why it’s important to have a short sale expert on your side. 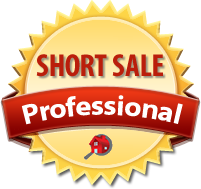 There are advantages and disadvantages to short sale, some of which are listed at right. To help expedite your transaction and protect your interests. There are many important details involved that could delay your transaction, so you want someone on your side who can spot the details and sort out any problems on a timely basis. Because of the paperwork, negotiations and complexity involved, be prepared for the short sale process to take several months. A good agent will stay on top of things throughout the process. If you are a Seller, an experienced short-sale agent can help you negotiate with the lender, submit the proper paperwork (letter of authorization, preliminary net sheet, proof of income & assets, bank statements, purchase agreement, listing agreement, etc. ), prepare a Comparative Market Analysis (CMA) to show the prices of similar homes in your area, and help you determine your marketplace. If you are a Buyer, your Realtor can help you negotiate through the seller's agent, research the short sale listing (how much is owed against the home, how many loans are recorded, how many offers are you up against, etc. ), make offers and submit appropriate paperwork. Just because a property is listed with short sale terms does not mean the lender will accept your offer, even if the seller accepts it, so it helps to have an experienced agent on your side who understands the local market and the lenders involved. The short sale agent you choose can make or break the deal, so choose wisely. I am an experienced Certified Short Sale Specialist (CSSS), Realtor, and am certified in Real Estate Owned (REO) or bank-owned properties. Let me work on your behalf. Whether you are selling or buying a home through short sale or REO, I can make the process easier. Call me at (434) 531-5351 or e-mail hash@FindHomesInCharlottesville.com. Best Deals in Central Virginia! Be aware that the seller does not need to be in default before a lender will consider a short sale. A lender may consider a short sale if the seller is current but the value of the home has fallen. The seller may owe more than the home is currently worth, so a discounted price might bring the price in line with market value, not below it. If the lender is not willing to negotiate a lower payoff balance, a short sale may not eliminate the remaining balance after sale, thus requiring the homeowner to come up with additional funds to pay it. And, just because your lender accepts a short sale doesn’t mean they won’t legally pursue payment of the difference between the amount owed and amount paid. A short sale does affect credit, but the impact is significantly less than a foreclosure (usually equal to only about 2 to 3 late payment dings). Short sales, like other types of settlements, remain on a credit report for seven years. If the lender forgives a portion of the debt, the IRS could consider that debt forgiveness as income and tax the homeowner on it. There are exceptions to this, as outlined in the Mortgage Forgiveness Debt Relief Act of 2007. A deed-in-lieu is an alternative, but it adversely affects the seller just as bad as a foreclosure. A good bankruptcy attorney will often say negotiating a short sale then claiming bankruptcy is far more advantageous than allowing a foreclosure then claiming bankruptcy. They may also advise that claiming bankruptcy after the short sale is still better than fore-closure if you cannot negotiate with the seller's bank to call the loan satisfied after the short sale and they come to the seller for the difference as an unsecured loan. If you still have your job and can still barely make payments, yet you have a hardship of some sort, (severe illness, mounding medical bills, etc. ), then the bank may be willing to work out something called a Loan Modification. There are HUD approved organizations that are qualified experts to help you through this process. They like to know, however, that you have an experienced Realtor on hand who will be able to sell the property in the even a loan modification can't be worked out.